Empress EugÃ©nie was one of the most glamorous, celebrated and ultimately tragic figures of the nineteenth century. Wife of Napoleon III and close friend of Queen Victoria, she suffered the loss of her beloved sister, her only son, and her adopted country. But did EugÃ©nie take her greatest secretâ€”an illegitimate child, conceived when she was a teenager in Spain and fathered by the only man she ever truly lovedâ€”to the grave with her? And if so, what became of the baby? After half a lifetimeâ€™s research Joyce Cartlidge has pieced together evidence from historic records and clues in correspondence from EugÃ©nie and her family and friends, some of it never printed before, to tell a compelling story of love and motherhood that ties the Spanish house of Montijo and the French throne to a small family in Victorian Lancashire. 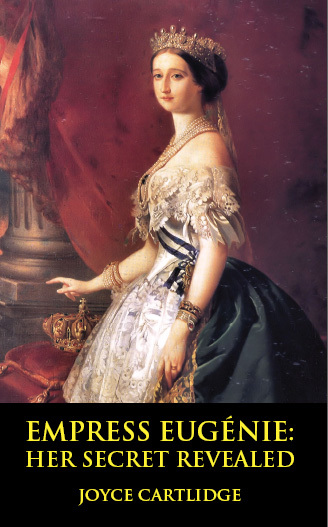 Described by the Mail on Sunday as â€˜an extraordinary odyssey into family historyâ€™, Empress EugÃ©nie: Her Secret Revealed is published by Magnum Opus Press on 7th June 2008. You can read the introduction and first chapter of the book by clicking on the link below.Â You will need Adobe Reader for this. Empress Eugenie Introduction and Chapter One. Order the book from Wordery.com, with free postage to anywhere in the world.